Yosemite National Park is easily the most beautiful of the seven national parks in the state of California and with a visitation of over 5 million a year, it is also the second most visited national park of the country - second only to the Great Smokies. 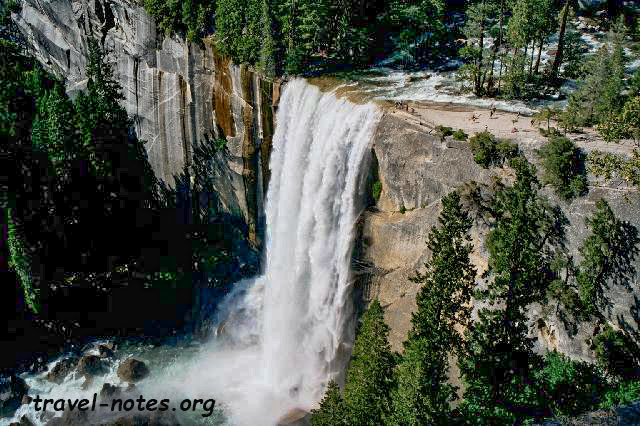 The park is situated few hours east of San Francisco and is best known for its falls - six of which are in the top thirty in the world. The park is at its best in late spring when the melting winter snow make the falls look spectacular. In fact many of the lesser known falls, including the Ribbon Fall (tallest in the valley and sixth tallest in the world), can be seen only during this time of the year. 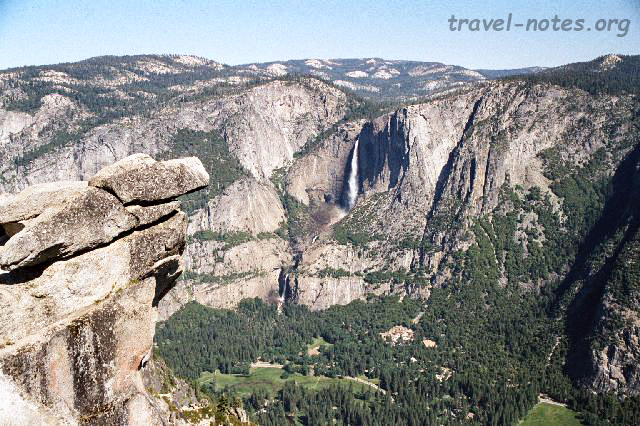 The major attractions of the park lies in what is known as the Yosemite valley which was carved by an ancient glacier. Merced river, which flows through the valley is all that is left of that glacier. Our trip to the park was made rather eventful by the ambitious 26 miles trek attempted by the 5 of us - Fido, D, Suraj, Praveen and yours truly - along the John Muir Trail. 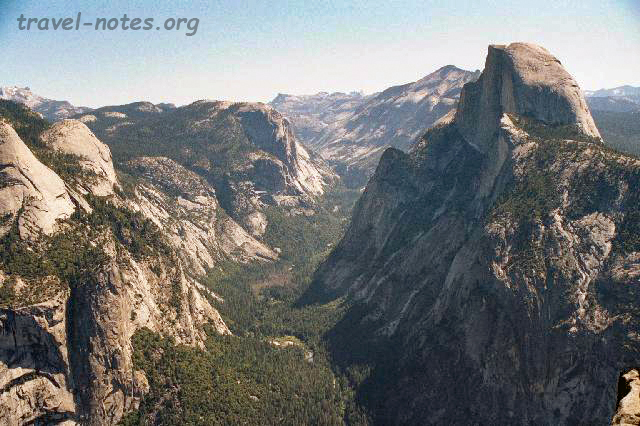 The trail starts from the Toloumne meadows in the north east corner of the park and ends in the Yosemite valley. The trail is normally closed in winter and is opened to the public during summer and the day we went was the first day it was opened for the year. The trail, hence, was nearly non-existent and mostly covered in snow. The first few miles of the trail on either end is normally the most frequented as it offers excellent day hikes to the visitors. 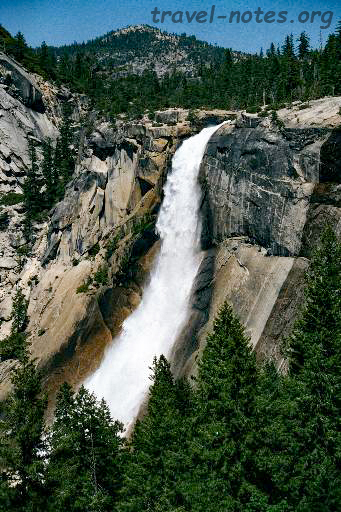 Day hikes from the Toloumne meadows lead to a beautiful pair of lakes called Cathedral Lakes and the ones from the valley lead to a pair of forceful falls - Nevada and Vernal falls. The part of the trail lying between these two destinations is generally deserted and poorly marked. When we visited, even the part of the trail leading to the Cathedral Lakes was covered in parts by snow and blocked frequently with stone barriers, main purpose of which was to keep the small creeks off the trail. I am not sure if the stones succeeded in diverting the water from the trail, but it sure did divert us from it, so much that by the time we made it to the lakes, we had taken twice the normal time and expended most of our energy. Although it was late in the afternoon, we were still confident of making it to the "sunrise", a camp where we would be pitching our tent for the night. What we did not foresee is that within half an hour from the lakes, we would be buried thigh deep in snow. The snow diverted us so badly from the trail that we not only lost our way but also one of our team members. After a futile search for our lost friend, during which we stumbled upon another lost group, we pitched our tent at an unknown distance from our destination. Next morning, after continuing on for about an hour sanity finally returned to the proceedings. At last it dawned on us we had no chance of reaching the valley and we turned towards Toloumne. Having been deserted by his group, Suraj, our lost friend, put a desperate search for us before retracing his way back to the Cathedral Lakes where he spent the night close to some other campsites. How he survived the night without a tent in the heart of bear country is still a mystery to him, us and the rest of the world. Next day he retraced his way back to Toloumne meadows only to be joined by his exhausted friends within a few hours. After exchanging the stories of survival, we spent rest of the day visiting the standard attractions of the park - El Capitan, Bridalveil Fall, Yosemite Fall etc. Of all the view points, in my opinion, the Valley View Point, the Inspiration Point and the Glacier Point are must see. To erase the disappointment of not completing our trek, we decided to put a day hike from the reverse direction to view the Vernal and Nevada falls. After the experience of the previous couple of days, we ended up breezing through the day hike, finishing the 7 hr hike in about half the time! Click here for more photos from Yosemite National Park. Click here for a complete guide to Yosemite.